17-20 year olds who are at risk of becoming regular smokers. Smoking is highly addictive – the “social” cigarettes you might think are harmless are actually leading you to regular smoking. And regular smoking has major impacts on your health and wellbeing. We presented cigarettes as sinister, manipulating and persistent. By personifying the cigarette, we show how their main goal is to recruit “social” smokers into becoming regular smokers. 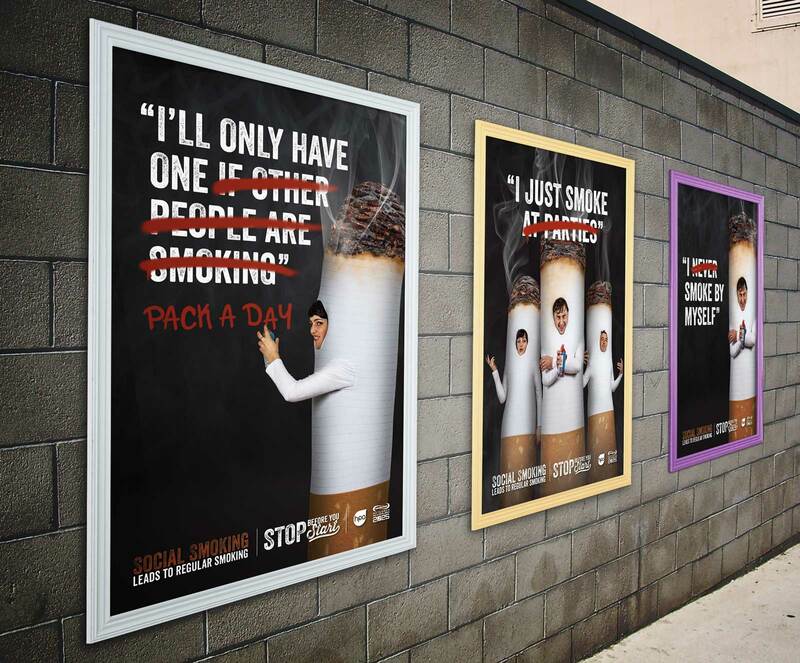 This phase of advertising is a natural extension of the previous campaign, with the communications now featuring several different characters from the “pack of cigarettes”. We now see how cigarettes can first seem appealing before they show their sinister side. There are many levels to this campaign, including a social media campaign showing the Secret Life of Ciggies. Contact us for more information on the thinking behind this highly creative campaign.